This mattress is so amazing! We were very hesitant to order online but so glad we did! My husband likes firm mattresses and I like soft so we ordered medium and it was definitely worth it! A special fabric cover, made by weaving cooling minerals with the fabric threads, offers a cool-to-the-touch construction that helps you feel comfortable at night. The cooling effect doesn't wear off over time, so you can avoid overheating night after night. Gel memory foam compounds the cooling effect for greater comfort, and the antimicrobial memory foam naturally resists dust mites. I was worried about purchasing a mattress online without being able to lay on it in person! I'm so happy I took the risk! I have slept soundly every night so far, which hasn't happened in years! Delivery was fast! Glad I read the reviews about opening it where it would be staying! Once opened, it inflated fast and would have been impossible for me to move by myself. Aside from the initial offgassing, which disappeared after the 72 hour suggested waiting period, I can't smell any odors, and I have an insanely sensitive nose. Can't feel my hubby moving...or my kids crawling in uninvited in the middle of the night! Very firm! I would buy it again and again! I bought this for the second/ guest bedroom. We have a lot of company staying with us . The other mattress was a standard cheaper model and been used in many apartments by family members! It had served its purpose. we have a tempurpedic and love it. I could not afford that, so researched other. 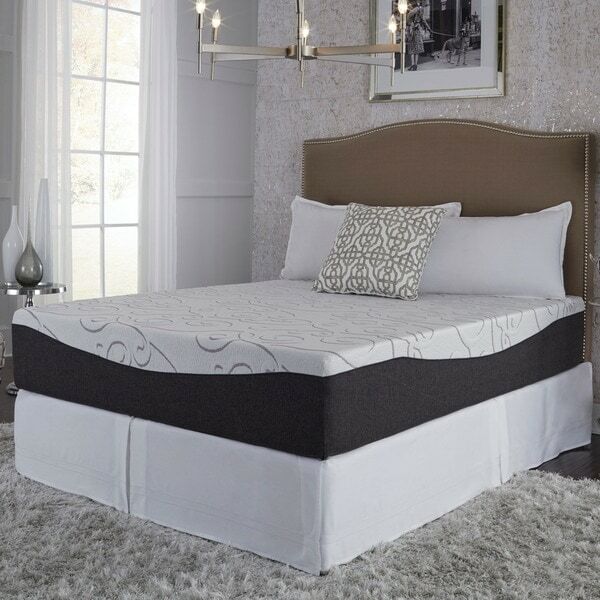 Overstock was the only ones that had these mattress at a great price ( when I sale) . I waited again for the sale and grabbed one! The firm is amazing! Other family members also sleep in this bed room when we are not feeling well or the snoring gets too loud by our partner! Anyway , this is the mattress to get! It does come rolled and not that heavy if you slide. I say watch the video! Do what they say. Make sure you have the right side up! There will be an outer sheet of plastic that it is wrapped in and it is wrapped around rolled mattress about two or three times. That is NOT the plastic that is keeping it air tight. Once you have the mattress in place with the help of another, as soon as you put a hole in that air tight bag/ seal, that mattress begins to expand!!! we cut off the bag fast fast fast and pulled it off from the bottom! Reset your mattress NOW. Once all the air gets in this thing in about an hour, IT IS HEAVY!!! . So any adjusting is now! It will be ready to sleep on that night! Our first guest was like " OMG it is so amazing" , I don't think she will ever want to leave! I am going to sleep on it this weekend! Why not! This is the best investment I ever made. I do have to get a mattress cover, which I did not,,, however, not too much of a problem. I chose the firm due to the different people sleeping on this. However, the first guest LOVES it. I did lay on it and did fall asleep in two minutes! Ha Ha! I have owned this bed for a little over 3 months now, and I really liked the option to choose your comfort. I chose plush since I am a side sleeper. Since sleeping on this mattress for a few months now, the bed has definitely met and beat my expectations. Some years ago I purchased a Queen Gel Memory Foam Mattress from the same company that sells another brand on Overstock and I still love that bed too. It is now in my spare bedroom. This item was described accurately and was a great deal. I am super satisfied with my choice and purchase and would recommend this to friends/family and anyone looking for a quality gel memory foam mattress for an unbeatable deal! Just set up last night. All positive reviews are true. Best night sleep we've ever gotten on a mattress we own. Absolutely comparable to high ticket name brand mattress we were quoted 4 times the price. I was a bit nervous ordering without trying but figured for one quarter of the price and all of the positive reviews I would take a chance and I'm glad I did. Arrived timely undamaged easy set up and within minutes once it fully expanded we knew we had made the right decision. Still new though so I'll update periodically as I'm not sure about longevity of quality and how it will wear over time but honestly very happy we spent a lot of time lounging on a high priced competitor and considered buying the mattress and adjustable bed frame for $5000.00 ( and that was after they knocked off $2,000.00 giving us a "deal") we walked away and I researched more, crossed my fingers and took a chance and purchased this mattress and adjustable frame (sleep sync adjustable mattress base also from Overstock) and saved a ton of $$. Again it can't be overstated the feel and quality of this mattress are completely comparable to the name brand at 4 times the price. We are simply thrilled and grateful my husband is working 7 days a week we are both working 12 hour days slept last night in absolute comfort not disturbing each other when moving and having upgraded to larger size bed we have plenty of room. Felt like we were each sleeping on our own cloud. We ordered the queen medium and absolutely perfect as of now. Can't say anything more positive about this we took the chance ordering online and truly very very glad we did. Just loved the Northern Lights 14 in. Gel memory foam mattress. I couldn’t get over how quick it turned into a large mattress. Was super comfortable. Would recommend it to everyone. I wanted to wait to write a review until after I had it for a few weeks. I love the mattress. It did have a smell to it but it totally dissipated after about a week. It was very easy to set up and slept on it the first night with no issue. My only reason for the 4 stars is that it is getting really soft where I sleep. Other areas are still really firm. I am going to sleep on the other side of the bed to try to allow it to "reshape" hopefully. I don't know if I have a bum box spring (only 5 years old) or if it is the bed. I also tend to sweat a bit which I have never had issues with that when sleeping on a foam mattress topper. I shopped around a lot for a mattress and this was the best review... but I didn't pay attention to the return policy. Had I seen that, I wouldn't have purchased it. I expected it to have a 100 night or more return policy but it's a no return. So keep in mind. I have a lot of health issues so I am in bed a bit more than most but it shouldn't be getting like this after 2-3 weeks. I am in bed maybe 10 hours each day/night unless I am sick. Overall, I am happy with the mattress but just kinda heartbroken that it is getting too soft. I have a very bad back, arthritic shoulders and neck (and I am only 40). When on the firm area of the bed, I am golden! These mattresses are very comfortable and do not sleep hot like many memory foam mattresses. The quality and price are attractive and I’ve been pleased with the purchase. I bought this for my mom and she ABSOLUTELY LOVES IT! Perfect firmness, not hot to sleep on. A great deal compared to other memory foam mattresses. HIGHLY RECOMMEND this mattress. I love the comfort of this mattress. Unfortunately it came with two rips on one side and a large stain in the middle. Almost like it was used or something very dirty was resting on this mattress for a while. Gets a lot of compliments. We bought this Gel Memory form to replace our 5 years old mattress and so far, this is probably one of my best buy so far. I am so pleased with the purchase. Love it!!!! Most comfortable bed I have ever slept in. We were a little unsure at first because it seemed harder than expected but once we got used to it you will get the best nights sleep ever. This is my second memory foam bed and I love this one even more than the first one. I had the other for 4 years and the only reason I ordered a new one was I we to a king and placed the other in the guest room, still like new! I don’t normally write reviews but I so happy with this bed!! It’s soft, it wraps itself around you welcoming you to bed but supporting as well. I wake up refreshed, no hip or back pain and for the first time since my water bed days I don’t want to get out of the bed. It’s not my grandmothers feather mattress but close with support. I highly recommend this bed!! I received my beautiful bed 🛏 today. It can right on time. It is a beautiful fabric. It is heavy. As soon as you start to open it, it starts to in-flight, so have it where you want it, because it will be to big to move ones the air gets in it. I lad down on it after about five hours. I went right to sleep 💤. I have a hard time going to sleep, I have severe back problems. I had to have back surgery and neck surgery so I have a hard time laying where I not hurt continuously. I think 🤔 I have finally both the right mattress. After I have it for about a month. I will write another review, and by the way the Price is awesome. I bought this mattress after searching numerous reviews. I must say it is incredible, and that doesn’t even describe the comfort. I originally purchased an expensive beauty rest mattress that was only 8 months old. Had horrible neck and low back pain. Decided to try something different not to mention softer. This mattress has passed my expectations of what I reviewed. It does come like it states in a big bag. I opened it and let it settle for 2 days. My mattress did not have a smell like some I read reviews on. I think it’s because I opened it immediately. My husband can move or get out of bed and I can’t feel his movement. Freaking love this mattress! Wish I had bought sooner. When your 12 year old granddaughter complains that her mattress is not comfortable and several people have said they were coming to visit you and you need that bed to accomodate people there's nothing left to do but buy a new mattress! So glad I did too. EVERYONE who has slept on it has loved it. My sister in law just texted me and asked for the brand name and where I purchased the mattress. Best mattress ever!! I am so glad i purchased this mattress. so have a bad neck and back, so i need firm. This is exactly what i needed. I would highly reccomend this mattress for anyone who needs firm. It’s comfy and cozy and me and my hubby do not want to get out if bed. Haha. Best purchase by far. So far, so good. Less pain, after a long day on my feet. I’m not sweating at all. My only issues was that it was delivered a business day late. I ordered it when I did to h e it arrive on a specific day. I had to go without a mattress for 3 nights because of this. That’s why I only gave 4 stars. The mattress itself is 5stars. Exactly as described. Extremely comfortable and doesn't move when my husband rolls over or gets out of bed. We both have been sleeping better and wake up with much less aches and pains. Very comfortable bed. We got the medium firmness. It was fun to watch it grow before our eyes. Just make sure to have extra deep sheets and mattress pad. Comfy bed at a decent price. "What kind of glues are used in this mattress?" Yes, all of our mattresses are compatible with adjustable frames. We recommend using an 8" or 10" for best performance. "How does one decide between the types: plus vs firm, without real life sampling? I generally want a firm mattress but not something that doesn’t give. Thanks." I just bought a medium. My last mattress I swear, was not what I ordered. It was so mad because it was like sleeping on concrete. I was afraid to get medium, worrying that it was too firm. I have to say, it is plush enough for us but firm enough as well. I know firm and plush mean totally different things to every person. But I was really happy that I got medium. "Do I need a box spring?" "I have a 4 poster American Colonial full sized bed on a wood slat base. The measurements in.side the posts : 75 inches long / 53 inches wide Is this mattress description accurate: 54 inches wide? Want to avoid an overflow and then return issue!" Yes, our full sized mattresses measure 54" x 75". I hope it helps. "What is the difference between this bed, the Northern Lights model and the Item # 15869800 Choose your comfort Slumber Solutions model?" The construction of these two mattresses is very similar. However the Northern Lights model offers an exclusive cooling gel top that pulls body heat away while you sleep. We suggest reading the consumer reviews for both mattresses to determine which would be the best choice for you. "Has anyone received a damaged product? My mattress came with a large purple mark all the way down the middle."